Source: NBC News. Click to read full article. In his recent interview with Admiral Mike Mullen regarding the threat posed by the terrorist organization IS (Islamic State), Stephen Colbert momentarily discarded his hawkish conservative persona. The statement is a victory for truth over “truthiness.” Colbert pinpoints exactly why a war-weary America is preparing to drag itself back into an armed conflict after a decade long campaign that depleted our treasures and international credibility. Fear. But while we are willing to condone war at the altar of domestic security, Colbert reminds us that, without understanding the nature of each threat we fight, we are doomed to a perpetual fight against fear itself. Understanding the true threat posed by IS is the first step to delineating one conflict from another and to defining success. Like its name, the IS organization has transformed over time. Commencing operations in 2006, the Islamic State began as a group of Sunni extremists fighting American forces in Iraq. Indeed, commentators observe that the groups rise was a direct result of the American mission in Iraq. Many IS members were recruited to the group after they were confined to American prisons. Abu Bakr al-Baghdadi, the group’s leader, spent time in an American detention facility where he spearheaded recruitment efforts. Around 2011, IS sought to take advantage of the civil conflict brewing in neighboring Syria. President Bashar al-Assad and his Shia government have brutally repressed the Sunni population in Syria. When the Islamic State took up arms with a Sunni group opposing Assad, it also decided to move its headquarters to that country. Since then, IS has continued to capitalize on Syria’s fractured government by seizing important assets like oil wells and granaries, while avoiding protracted battle with government forces. Today, the Islamic State has expanded its territory and its ambitions. It now controls large portions of both Syria and Iraq, rendering borders practically meaningless. The group has consolidated its gains by declaring its territory a “caliphate”- a transnational state governed under a strict interpretation of Islamic sharia law. 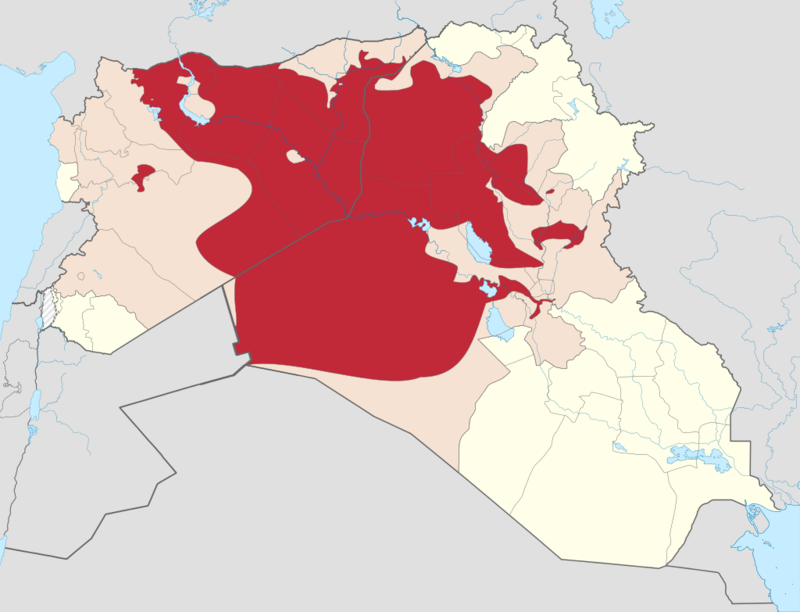 Territorial control of Islamic State. Red are areas under direct IS control; pink are areas in dispute. Source: Wikimedia. Americans fear of ISIS stems from the group’s brutality and competency. When IS invaded Mosul, Iraq’s second largest city, it easily defeated the American trained Iraqi army. IS broadcast Iraqi soldiers throwing down their arms and retreating. It also broadcast the mass executions of Iraqi army survivors. When residents of an IS controlled town violated a tenet of sharia law, the group broadcast the residents’ crucifixion to the world. After America carried out airstrikes against IS assets, IS broadcast the decapitation of American and British hostages. The Islamic State advances toward Baghdad. 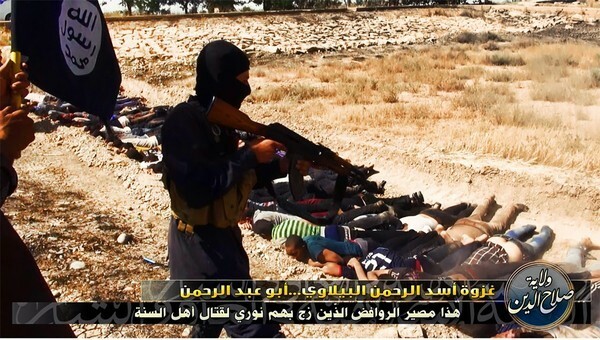 IS is certainty a brutal organization, but the world has been faced with many in the past. Remember Boko Haram in Nigeria? Or al-Qaeda in the Arabian Peninsula (AQAP)? Yet the inability of our officials to agree on the extent of the threat and what action needs to be taken harkens back to Colbert’s point. Before we condone intervention against ISIS, we need to first confirm the circumstances under which America should intervene. Unlike the semi-secretive, hands-off PDD-25 policy of the Clinton era—an executive order largely credited with allowing the Rwandan genocide to proceed unchecked—or the blunt and ever-shifting justifications of the Bush era, Obama’s approach to foreign intervention is simultaneously expansive and nuanced. In a Defensive Strategic Guide compiled by the Department of Defense in 2012, the President named as national strategic priorities the need to “prevent and . . . respond to mass atrocities” and to “provide a stabilizing presence . . . [to] reinforce deterrence . . . and increase U.S. influence.” These policies sound like reasonable grounds for intervening in Iraq and Syria, where mass atrocities and destabilizing presences are everyday affairs. 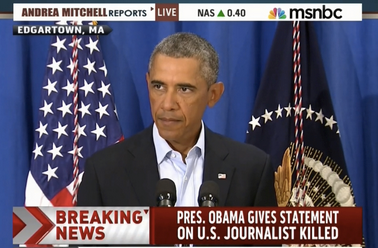 President Obama addresses the country after the death of James Foley by IS. Source: MSNBC. But aside the (very important) debate about whether these priorities are morally optimal, we first must ask whether they are even practically achievable. Even if the prevention of atrocities and the provision of stabilizing forces as a form of deterrence are ideal objectives, there may simply be no way to implement these objectives in a way that does not cause more harm than good. For example, consider President Obama’s recent authorization of airstrikes against IS. Daniel Benjamin—former State Department Coordinator for Counterterrorism from 2009 to 2012—warns, “[n]o one should be misled: U.S. airstrikes will likely hasten [the] possibility” of direct threats to the U.S., not reduce them. And is not the rise of ISIS just one of many examples of noble intentions gone wrong? So what are our options for achieving stabilization and atrocity prevention? Conventional wisdom tells us that airstrikes without ground forces are inadequate to defeat ISIS. At most, airstrikes can only tip the balance of a given struggle in favor of a U.S. ally. And while this strategy may be beneficial in Iraq, where the Kurds provide a moderate, well-organized force that the U.S. can turn to, it’s far less clear who can fill the void in Syria. And history shows that getting rid of one bad guy without a clear alternative often leads to someone just as bad stepping up. The second possibility is to deploy U.S. ground troops to temporarily fill in the gap. But this only pushes the problem with airstrikes down the road to the point where the U.S. decides to leave. While optimistic forecasters point to the ability of the U.S. to train local forces in the interim, such programs have a shaky track record at best (Afghanistan), and have failed entirely at worst (Iraq). Notably, Admiral Mullen suggests that, to be effective, such engagements might need to be thirty to forty-year affairs. That’s thirty to forty years of military costs and risking American lives for potentially lukewarm results. Although many agree that an isolationist approach is untenable in an increasingly global and nuanced world, this may be one fight we cannot win. Sure, we may knock down the first guy, but another bigger and badder guy will always jump into the ring. Perhaps there is a role to be played by a united international community, but in the current state affairs, true unity seems like a pipe dream not even worth considering. Unfortunately, the alternative—the U.S. going it alone—seems like no solution at all.